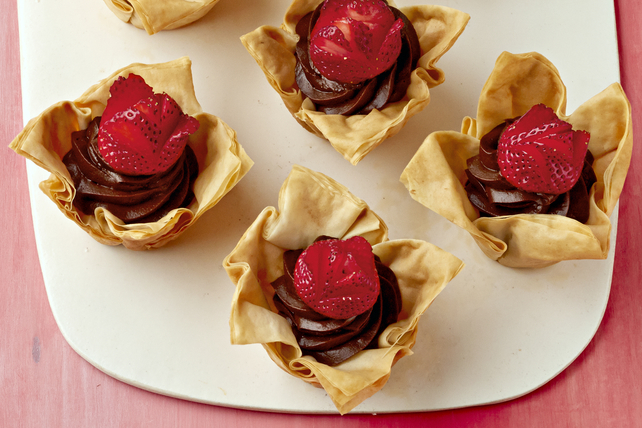 A simple chocolate mousse is served in delicate single-serving phyllo shells for delicious desserts you can share with family and friends. Spray 12 muffin pan cups with cooking spray. Place 1 phyllo sheet on work surface; spray lightly with cooking spray. Top with 5 of the remaining phyllo sheets, spraying each phyllo sheet with additional cooking spray before stacking as directed. Cut into 6 squares with sharp knife. Lightly press each layered square into prepared muffin cup. Repeat with remaining phyllo sheets to fill remaining prepared muffin cups. Melt bittersweet chocolate as directed on package. Gradually stir in 1/2 cup cream until blended; set aside. Beat remaining cream in medium bowl with mixer on high speed 2 min. or until thickened. Gradually add chocolate mixture, beating on medium speed until well blended. Add dry pudding mix; beat 2 min. or until thickened. Spoon pudding mixture into piping bag fitted with star tip; use to pipe pudding mixture into tart shells. Top with strawberry roses. Use small sharp knife to cut each strawberry into 5 thin slices, starting at tip end of strawberry and being careful to not cut all the way through strawberry. Gently separate slices in each strawberry to resemble flower. If you don't have a piping bag, you can instead use a resealable plastic bag. Spoon pudding mixture into bag, then cut small piece off one bottom corner of bag and use to squeeze pudding mixture into cooled tart shells. The tart shells can be prepared ahead of time. Cool, then store in tightly covered container at room temperature up to 24 hours before filling as directed. For added convenience, the filled tart shells can be refrigerated up to 3 hours before serving.